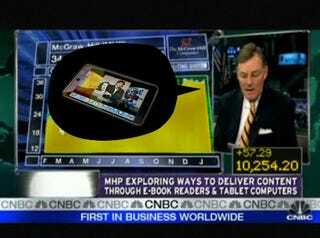 Remember when McGraw-Hill CEO Terry McGraw confirmed the iPad—and its OS—a day early on national television? And then Apple pointedly left them out of the presentation? Well, McGraw-Hill doesn't! No sir, never happened at all. [Mr. McGraw]'s speculative comments about Apple's pending launch, which he shared earlier in the day in a call with investors, were simply intended to suggest that if the new device were to use iPhone applications, many of our education products would be compatible with the technology and could be made easily available on it. See what he did there? Whatever McGraw intended to suggest, what he actually said was that there was a tablet, and that it was running the iPhone OS. And he was right! Which makes it a leak. And the idea that the CEO of a guaranteed major supplier of iPad content wouldn't have known those details about the device in advance is beyond inconceivable.